Luke seems to identify the Abomination of Desolation in this way: “…When you see Jerusalem being surrounded by armies, you will know that its desolation is near.” There would seem to require a very specific ‘signal’ to flee, and the urgency suggests a small window of opportunity, and we know that the armies withdrew for a season, which those who fled took advantage of. Would this then not imply that the abomination of desolation (or rather ‘that brings desolation’) was Rome ie Rome was the vehicle that was to bring desolation to Jerusalem that had heaped up judgement upon itself for reasons you give. Judgement was upon Jerusalem but the vehicle that brought this desolation was Rome, much as it had been Antichus IV Epiphanes had been the earlier Abomination spoken of by Daniel. Stuart, thanks for the comment. I agree there is a connection here, and Luke is reporting the same conversation as in Mark 13. However I’m not sure that the use of the same word ‘desolation’ necessarily means it’s the same part of the conversation. In Mark he speaks of the Abomination ‘standing where it ought not be’, and it’s a clear reference to a sacrilege in the temple. Luke 21:20 however speaks of armies surrounding Jerusalem, and the desolation is of the city, rather than the Temple. 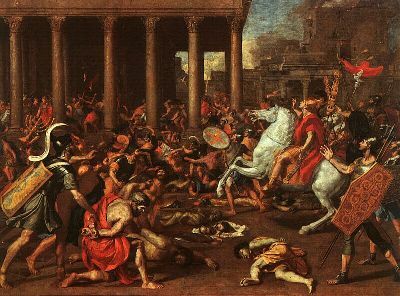 So while the Romans did bring desolation, I still believe the ‘abomination’ was the actions of the Jewish zealots within the Temple which desecrated the Holy Place. In that sense, the desolation was a spiritual one, to which God responded by bringing the physical desolation through Rome, marking the end of the Old covenant and the beginning of the new age in which the physical Temple will never again be used as it is made obsolete through Jesus.